The park was created as a result of recommendations made in the Kamloops Land and Resources Management Plan. Visitors can enjoy hiking, nature study, wildlife viewing, and hunting. Scenic and cultural heritage appreciation are also popular. The summit of Mount Savona – accessible by 4-wheel drive road – affords excellent views of the dry Thompson River Valley and Kamloops Lake. Wood ticks are most prevalent between March and June. These parasites reside in tall grass and low shrubbery and seek out warm-blooded hosts. Although they are potential carriers of disease, they are a natural part of the environment and can be easily avoided. Your legs should be protected by wearing trousers tucked into socks or gaiters. After outdoor activity, thoroughly examine yourself. Check your pets for ticks as well. Bring your own drinking water as there are no water sources in the park. There are no toilet facilities. Visitors should exercise proper backcountry sanitation procedures when no facilities are available. Deposit human waste in cat holes. Cat holes are 6 to 8 inches deep and should be located at least 100 feet from any water source. Thoroughly cover and disguise cat holes when finished. Bury toilet paper as well. Do not burn it. The park is located off Hwy 1 approximately 35 km west of Kamloops. Access is by Tunkwa Lake Road from the town of Savona. 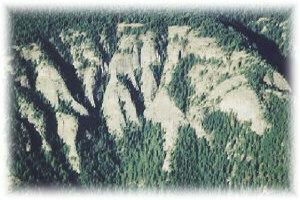 Cultural Heritage: This park contains several important cultural sites for the Skeetchestn First Nation. Please be respectful of these protected sites if you come across them in the park. Conservation: Cliffs, canyons, dry ridges, old growth Douglas-fir, pockets of high elevation grassland, a small lake and marshland are part of Mount Savona Provincial Park. The park has the highest (elevational) known occurrence of fame flower that grows on Kamloops lavas at specific elevations. The Fame flower (talinum sediforme) is found scattered and infrequent in the Okanagan and Thompson areas. The flower likes the dry exposed slopes and ledges at the low and mid elevations. The flowers are usually white but may have a pink or yellow tinge. There are five petals. The leaves are a fleshy, waxy looking, green, somewhat circular and form a ground covering similar to a mat. The flowers usually grow in clusters of 3-9 individual flowers. The Fame flower blooms late May through July. Approved Mount Savona Provincial Park Management Direction Statement�[PDF] is available online in pdf format. There are no designated cycling trails but the activity is allowed. Bicycle helmets are mandatory in British Columbia. Hunting is permitted only during lawful game hunting season. Check with Hunting and Trapping Synopsis for regulations. Exempt from the No Hunting, No Shooting Restrictions within 400 m of the center of park roads.